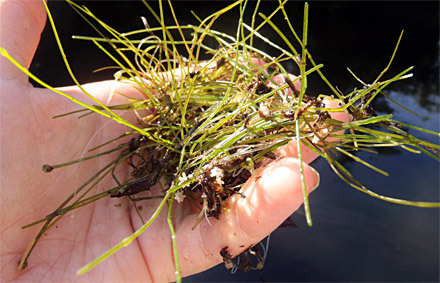 This is resource page for aquatic invasive plants (weeds) including information on identifying them, and how you can help if you choose to. In Michigan, Starry Stonewort is becoming a real issue with over 120 lakes at least infested with it. Eurasian Milfoil and Curly-leaf Pondweed have been an ongoing issue on many lakes for years. Curly-leaf Pondweed was actually planted by some in the past to provide 'habitat' by some people with a mistaken idea about how to provide habitat. While Eurasian Milfoil can provide really good bass fishing at some levels, its tendency to form solid mats covering large areas can be detrimental to many water body users, and even make fishing less productive at times. Treatments against Eurasian Milfoil often end up being overdone, killing almost everything and taking away almost all the fish habitat, which is never a good thing for fishing. Starry Stonewort (Nitellopsis obtusa) is a newer, aggressive aquatic invasive macroalgae that can be found anchored to lake bottoms in thick, dense, impenetrable mats! It resembles other common, native aquatic plants. When dense mats form over large areas of a lake basin, it can hinder recreation, and smother fish habitat and preferred native plants. Starry Stonewort is easily spread from water to water by boat trailers. Only 'male' plants have been found in the U.S. to date so the plant only spreads by physical transfer of plant parts from one water to another by boaters and anglers. It is believed Starry Stonewort originally came into U.S. water from the ballast of large ships into the St. Lawrence River and the Great Lakes. It is a native of Eastern Europe where it is considered good habitat and endangered. Meanwhile, it seems to flourish in many waters it has entered in Michigan, and a few waters in Wisconsin and Minnesota. It is thought it may have become so aggressive and successful here by hybridizing with our similar, native sand grasses. Much more still needs to be learned about this invasive plant here, especially since known treatments are generally unsuccessful at controlling the spread of the weed. This is a short, very good video from the University of Wisconsin Extension - Lakes showing how to identify Starry Stonewort. Here is a longer MiCorps / MDEQ video with real helpful information about identifying 4 different aquatic invasive species (Eurasian Milfoil, Curly-leaf Pondweed, Starry Stonewort, Hydrilla), and how you can volunteer to monitor lakes for them, and/or report them in Michigan. State of Michigan Invasive Species Page - Michigan's Invasive Species Program is cooperatively implemented by the Michigan Departments of Agriculture & Rural Development, Environmental Quality and Natural Resources. Protect Your Waters and Stop Aquatic Hitchhikers! WHAT CAN YOU DO?